(Voice of America News) – The 2016 Invictus Games began this week in Orlando, Florida. The games are a sports competition, similar to the Olympics, for former soldiers injured in combat. Britain’s Prince Harry started the games in 2014. He also served in the British military for 10 years. That time included two tours of duty in Afghanistan. At the end of his military service, he founded the games. The first competition was in London. Harry said the games serve as motivation for wounded soldiers working their way back to health. The games take place over five days and include 10 competitions. Closing ceremonies are May 12. Fifteen countries are sending athletes to the event. They include Afghanistan, Australia, Canada, Denmark, Estonia, France, Georgia, Germany, Iraq, Italy, Jordan, Netherlands, New Zealand, the UK and the U.S. More than 500 athletes are attending. The athletes compete in events including: archery, indoor rowing, powerlifting, road cycling, sitting volleyball, swimming, track & field, wheelchair basketball, wheelchair rugby and wheelchair tennis. The presenting partner Jaguar Land Rover also organized a driving challenge. William Reynolds is the captain of the team from the United States. He was injured by shrapnel from a bomb in Baghdad, Iraq in 2004. Reynolds recovered well enough to return to duty, but had his left leg amputated in 2013. 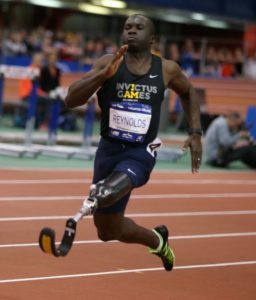 Reynolds competed in short running and longer cycling events at the Invictus Games in 2014 and is competing in the same events this year. In an interview with Fox Sports, he said competing at Invictus is a good goal for people recovering from war injuries. Getting ready for a competition provides purpose for people who may be tired of physical therapy. “Adaptive sports helped me become an athlete again,” Reynolds said. In Latin, the word invictus means unconquered. Reprinted here for educational purposes only from Voice of America Learning English. May not be reproduced on other websites without permission from the VOA .com. 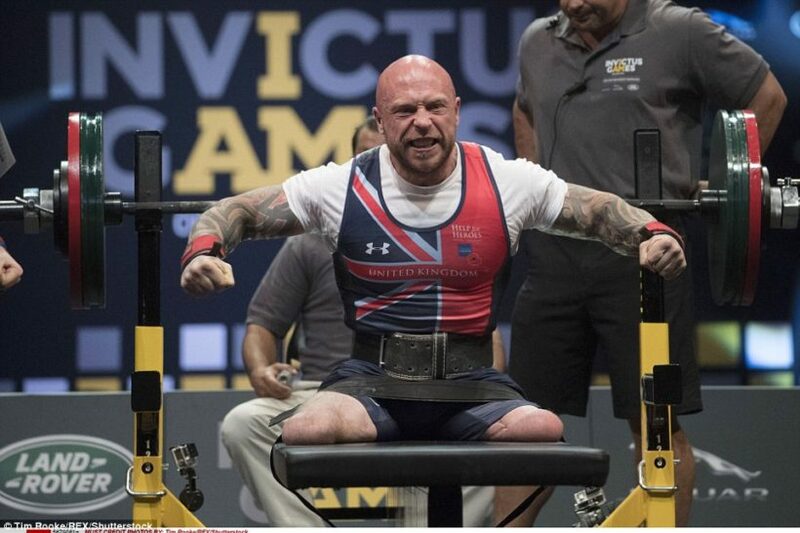 Power lifter Michael Yule, who lost both legs to a Taliban bomb in Afghanistan, as he lifted 418.9 pounds to win the first gold medal for Britain. Prince Harry cheered on the competitors, including Britain’s power lifter Michael Yule, who lost both legs to a Taliban bomb in Afghanistan, as he lifted 418.9 pounds to win the first gold medal for Britain. Harry presented the medal to Yule, and the two men clasped hands and hugged each other. “Prince Harry is a top lad and he knows where we’re coming from. That’s the thing, there’s no sympathy – we don’t want that – it’s just we’re the lads, he’s a lad, we’re getting on with it, and he’s a prince second to us. He’s such a supporter of all injured servicemen worldwide now and I’m sure everybody looks upon that. He puts a lot of pressure on people – high people – to make sure the boys are looked after. I’m sure we’d be in a worse place without him. 1. a) What are the Invictus Games? b) When and where do the 2016 Invictus Games take place? c) What is the meaning of the word Invictus – why was this name chosen? 2. When did Britain’s Prince Harry found the games? What association does Prince Harry have with the military? 3. How does Prince Harry explain the purpose of these games? 4. a) List the events athletes compete in during the Invictus Games. b) How many athletes are competing in this year’s games? c) How many countries sent athletes to this year’s events? 5. a) Who is the U.S. team captain? In what events does he compete? b) What does he say about the games? 6. Read the “Background” below and watch the videos under “Resources.” How are you inspired by these men and women? The Invictus Games are an international Paralympic-style multi-sport event, created by the British Prince Harry, in which wounded, injured or sick armed services personnel and their associated veterans take part in sports including wheelchair basketball, sitting volleyball, and indoor rowing. Named after Invictus, the Latin for “Unconquered, Undefeated” the event was inspired by the Warrior Games, a similar event held in the United States. The first Invictus Games took place in 2014 in London. The Warrior Games is a multi-sport event for wounded, injured or ill service personnel and veterans organized by the United States Department of Defense. The Warrior Games have taken place annually since 2010. Through 2014, the Warrior Games was hosted by the United States Olympic Committee in Colorado Springs, Colorado. 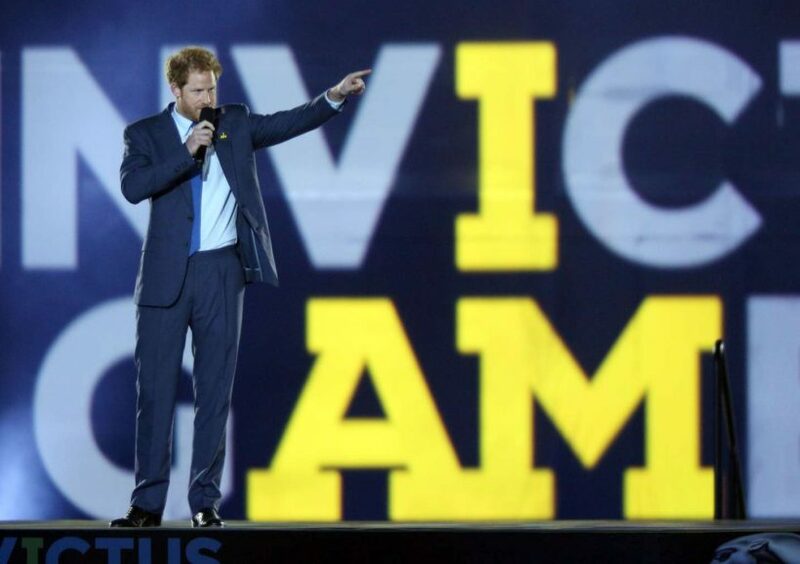 Britain’s Prince Harry, at the time serving as a Captain and helicopter pilot in the British Army, opened the 2013 Games, which inspired him to create the Invictus Games. The 2015 event was the first organized by the United States Department of Defense (DoD). It was held June 19–28 at the Marine Corps Base Quantico in Virginia. Teams from the Army, Marine Corps, Navy/Coast Guard, Air Force, Special Operations Command, and the British Armed Forces took part, competing in eight adaptive sports. Read about the sports events at the Invictus games. Watch 2016 Invictus Games and Replays Online at espn. Read an article about retired U.S. Army Captain William Reynolds, the captain of the U.S. team.